Website visitor Neil wrote to request that I scan and publish this article for the Cessna Airmaster, by Patricia T. Groves. 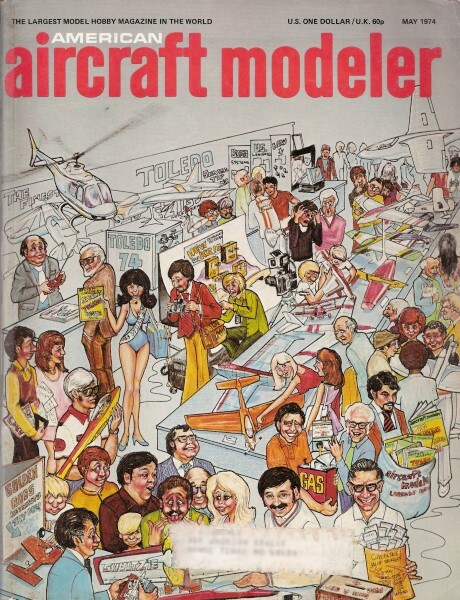 It was scanned from my purchased copy of the May 1974 American Aircraft Modeler magazine (page 62). 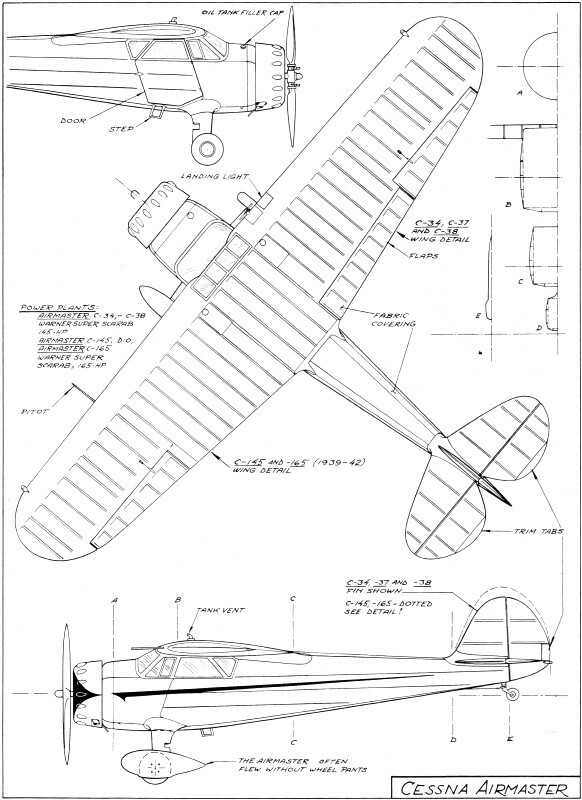 Line drawing for this fine aircraft were drawn by Björn Karlström. All copyrights (if any) are hereby acknowledged. A tradition of excellence in lightplane engineering grew out of the Depression. The mastermind behind it all was a guy named Clyde. June 1933 wasn't exactly a bright and shining year in which to be graduated with an aeronautical engineering degree. Industry-wide, aviation was floundering, and many companies had gone Belly up. Those managing to hang in there, were only doing so on a barely quivering shoestring. Engineers, mechanics, pilots or constructors were happy to work - anywhere - even if only to be able to say they were. After all, when he'd started in at the university in Wichita, Kansas, things sure looked promising enough. Aviation was a growing industry, and his uncle's Cessna Aircraft Company was among the firms there in town. With 200 airplanes already off its line, Cessna Aircraft was going great guns. They were monoplanes, too, in a day when monoplanes were considered pretty freaky. It was still a biplane era. And any monoplane with fully-cantilevered wings was especially suspect. Like a prostitute-no visible means of support. But Cessna monoplanes gradually gained acceptance within the aviation society. During 1927, '28 and on into '29, good performance at air races earned good notices and brought customers to the door. Americans like a winner. The shock waves of the Depression had an immediate effect. For many, the thin line between extinction or survival quickly evaporated. Investor-held stocks became pieces of paper, not even worth the pulp they were printed on. But for Clyde Cessna, "extinction" wasn't an option. Deeply rooted in his nature was an American Great Plains heritage, wherein wagon trains and a hard scrabble history produced lean, diligent Westerners-fiercely independent and with confidence in their own ability. When Cessna stockholders gathered for their annual meeting in Wichita on February 5, 1930, a large black cloud enveloped the room. "OK," Clyde admitted, "so we're in a bad situation. If we can't do what we planned to do, then we'll just have to do what we can do." Before anyone could argue, he pumped out a plan. "Look - some people still have money and can afford to buy airplanes. And those that have airplanes are going to need servicing. Furthermore, people want to fly. And if they can't fly airplanes-well, we have this $398 glider that just about anybody can afford! It's salesmanship that will beat this depression!" Believing in himself, hard work and keeping the place open didn't exactly revitalize the Board of Directors, but it did keep Cessna from collapsing. For the moment. The Cessna Company managed to limp through 1930 selling gliders, an occasional' airplane, doing maintenance work, renting out unused factory space, racing for (much needed) prize money-anything to make a buck. But the massive debts just wouldn't disappear. Nor should determination and hard work erase stockholder pessimism. At the next annual meeting, in January 1931, the Board of Directors threw in the towel. Although not officially dissolved, the company nevertheless voted Itself into deep hibernation. And Clyde was 'let out into the cold. With his son Eldon, Clyde then opened up a small shop down the street and went back to work. Getting through 1931, '32 and '33 under the name C.V. Cessna and Company, father and son produced custom-built aircraft, including two racers. These made-to-order airplanes were a progressive improvement over past Cessna models. And, although not evident in the press of the moment, this period provided an education for the future. While the C.V. Cessna "School of Hard Knocks" was in session, Dwane Wallace Was finishing at the university. He'd almost given it up a couple times himself, but the family inability to quit-anything-was too strong. Then, in June 1933, he proudly took his Bachelor's Degree to his uncle's shop in order to show him that he, too, was ready to work. They laughed and joked about how it all stemmed from the day, back in 1921 when CV had crammed Dwane arid 'his two brothers, Dwight and Deane, into the front cockpit of a Swallow biplane, and had taken them for their first airplane ride. And now, Dwane was a pilot himself. And an engineer. And ready to work. But a lot of water had gone under the bridge in those 12 intervening years. The cold facts were that CV and Eldon were on short rations. They couldn't take him on. So Dwane Wallace talked himself into a job with Walt Beech, who had fired up again in a rented area of the closed Cessna plant. But, although Dwane went to work for Beech, he went to work on his uncle. Things were beginning to open up now, and it was time for Cessna Aircraft to wake up and get with it. When the Board of Directors gathered on January 10, 1934, there was quite an eye-opener ready for them. By .the time the meeting convened, a Cessna-Wallace windmill was in full swing. At the end of that January day, there was almost a whole new Board of Directors. Dwight Wallace, Dwane's attorney brother, had made a trip through investor-land gathering up all the proxy votes he could muster. With Clyde Cessna now President, Dwight as Secretary-Treasurer and Dwane in charge of the plant, the new Board of Directors agreed to again manufacture the DC-6 line of airplanes. Also, approval was given for the new airplane that was to become the beginning of the Airmaster series of Cessna airplanes. 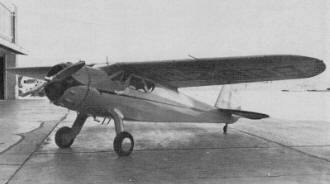 From January 10, 1934, until June I, 1935, when the prototype was completed, the C-34 (named for its design year) was a successful combination of past Cessna Aircraft Company construction techniques, Wichita University classes in aerodynamic theory and "School of Hard Knocks" courses in what makes a winner. 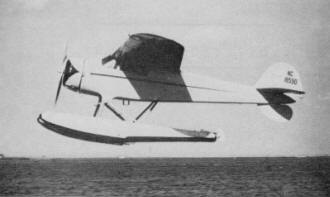 Fabrication of the C-34, and subsequent models, was virtually the same throughout the production life of the series. 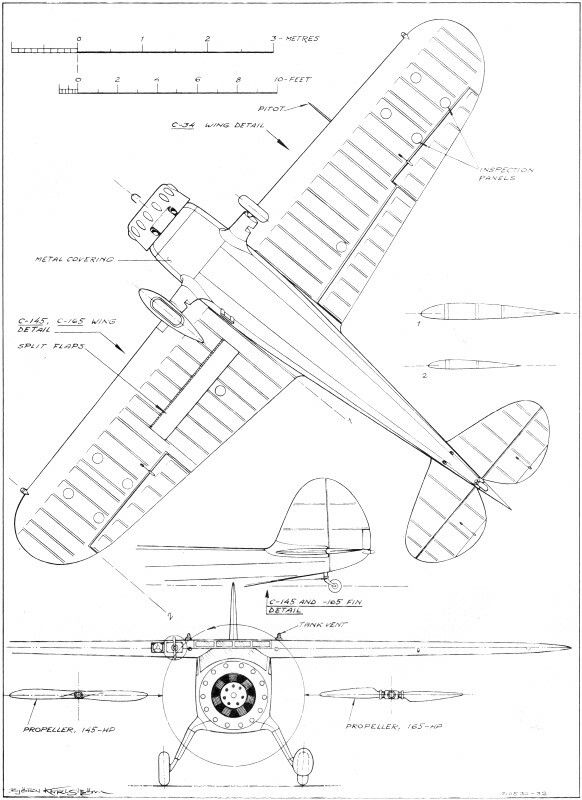 The welded steel fuselage was fabric-covered, except for Dural in the area between the cockpit and the firewall, on the landing gear fairings and the wing and fuselage fillets. Using a NACA 2412 airfoil, the fabric-covered wings consisted of spruce ribs and box spars. The chord of the wing tapered from 84 in. at the root to 56 in. at the tip. Flaps and balance ailerons were mounted directly to the rear spar. 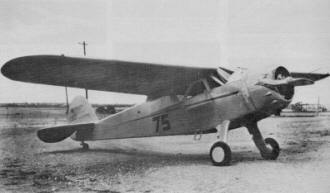 The C-34 marked Cessna's first use of wing flaps. Early ones were wood and fabric; later models were metal. Fabric-covered, cantilevered tail surfaces were of conventional wood construction, while the rudder and elevator were of steel tube. A NACA cowl enclosed a 145 hp Warner Super Scarab engine turning a Hartzell wood propeller. The first C-34 (c/n 254) rolled off the line on June 1, 1935, and was flight-tested by Cessna pilot George Hart. Flight trials revealed that the high-lift wing and low drag construction gave the four-place airplane a cruise speed of 143 mph, a maximum speed of 164 mph, and, with flaps activated, a comfortable landing speed of 47 mph. Learning that your prototype achieves a better than one mile per hour per horsepower makes for one of your more satisfying days! These flights and the usual modifications and improvements that followed, soon earned the C-34 the Civil Aeronautics Authority's No. 573 Approved Type Certificate-that all-precious permit to go into production. During this time there was precious little money coming in. As with all the airplane manufacturing companies of the period, what cash there was on hand was used to stave off creditors, so they wouldn't cut off vitally needed supplies and utilities. Workers, only hired for the minimum required hours, had to be paid. This usually meant that when paydays rolled around, company officers went home with a pocketful of Hope. Hope in the future, hope that no one in the family got sick, hope that the land-lord, the grocer, everyone could hold out-just a little longer. While trials were still being conducted on the prototype C-34, the second (c/n 255) was sold. With a dandy $4985 destined for the company's emaciated treasury, Dwane Wallace and George Hart decided to deliver the new airplane personally. Besides, the trip would be a good cross-country test for the C-34. I n July, they flew c/n 255 from Wichita to its new owner in Tuxpan, Mexico, and averaged a most respectable 16.9 miles per gallon on the gas. With satisfaction over the results of the trip adding more substance to all the hope everyone had been living on for so long, the thing now was to get the word out. After a Depression Years hiatus, the four-part Detroit News Trophy Race for aircraft efficiency was again an event in the National Air Races, to be held August 3-September 2. Lured by the potential of cash prizes and much-needed publicity, Cessna's No.4 C-34 went to Cleveland. After copping the Detroit News Air Transport Trophy and winning the 550 cu. in. 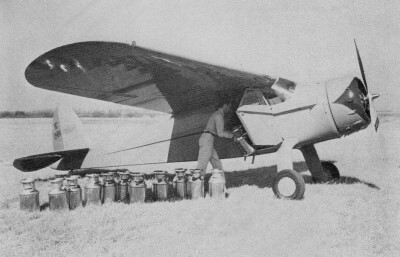 displacement Sweepstakes, the C-34 returned to Wichita a winner. Production of the C-34 amounted to only nine that year, but the publicity that resulted from the Cleveland Races brought customers to Cessna. By keeping Cessna aircraft on the racing circuit and before the public, C-34 production rose to 33 in 1936. On October 8, 1936, Clyde Cessna announced h is retirement, and Dwane Wallace succeeded him into the presidency. Improving and updating the C-34 led to the design of the C-37. By Christmas 1937,47 of these new models had rolled out the door. Wallace and Cessna employees could now look back on the fallow years of 1931, '32 and '33. In September 1938, the prototype C-145 (so designated for its 145 hp Warner Super Scarab engine) was completed. By eliminating the shortcomings of the C-38, the C-145 Airmaster incorporated further improvements of hydraulically operated brakes and electrically operated split-type wing flaps. Here indeed was the master of the air. During 1938, a gradual improvement in the U.S. economy, wider use of air transport as a means of travel, expansion in air field and airport facilities, the growth of air safety regulations and practices, all encouraged public acceptance of airplanes. Sticking firmly to conservative policies, the company began to investigate the twin-engine market, while continuing production of the successful C-145 and its sister ship, the C-165 (165 hp Warner Super Scarab). Since both the prototype C-145 and C-165 airplanes are still on the active registry (as of October 1973), it would appear that built-in obsolescence was not a Cessna practice. From September 10, 1938, until events of December 7, 1941 closed down Airmaster production, a total of 80 of the C-145s and C-165s were produced at the Wichita plant.3 In .the C-165, a happy marriage of aircraft and engine design produced the envious rating of one mph per each horsepower - not a bad figure after seven years production. 1 Except as noted, all data furnished by Cessna Aircraft Company. 2 Paul R. Matt, "The Airmasters from Cessna" Historical Aviation Album (Vol. 4, Jan. 1969) pp. 14ff. 3 These figures include three C-165Ds (175 hp Warner Scarab D engine) and one experimental General Motors powered GM Special.